Having dined on Thai for lunch I had a hankering for more fresh and spicy SE Asian flavours. Also, as part of an ongoing January clear out, I wanted to use up some of the bits and pieces sitting unnoticed at the back of the cupboard. You know, those things that looked like a great idea in the shop, but then somehow just never got used. Delving into the fridge netted me a pack of raw prawns, some poached chicken and a couple of slightly tired stalks of lemongrass (left over from Wednesday’s cleansing chicken soup), basil, mint, half a cabbage and a lime. The store cupboard meanwhile served up a pack of dried rice spring-roll wrappers. Add to that some Indonesian chilli and ginger sauce I got for Xmas, peanut paste, sweet chilli and crusty old bottle of fish sauce and I had the beginnings of a mini-feast. Coriander and some fresh chillies would have really livened things up, but I had the essentials to hand to do something I rarely attempt. An improvisation on a SE Asian theme. Give me regular European, Levantine, even Indian ingredients and I’m happy to wade in and create something on the fly. But the textures, flavours and above all balance of SE Asian cuisine mean I’m hesitant about going it alone. But everyone’s got to start somewhere, and I remember when I wouldn’t attempt a curry, a casserole or a tagine without step-by-step instructions in front of me. The prawns I decided – after a bit of dithering – to blend into fragrant Thai-style fried cakes. The chicken and cabbage would be covered in a spicy and nutty dressing, then wrapped in the rice wrappers with loads of fresh basil and mint. There ended up being a lot of chicken and cabbage mix, so what I didn’t use in the rolls went into a salad with fine rice vermicelli noodles and loads of fresh lime and more hot chilli sauce. I reckoned on mincing the last of the chicken (there really was quite a lot) with ginger, garlic and more lemongrass to fill some of those delicate fried spring rolls I loved so much in Hanoi. I reckoned without my fat-fingered and clumsy roll-rolling skills. They looked great, but as soon as I lay them in the boiling oil they gently unrolled themselves, disgorging the carefully minced filling into the oil. You can’t win ‘em all, and the filling did turn into a kind of Larp to snack on while i was cooking. Mix together the dressing – I put all the ingredients in a small jar and shook it like mad. Finely shred the cabbage using a very sharp knife or mandolin and pull the chicken into thin strips. Tear the herbs (slicing them with a knife will cause them to blacken at the edges) and mix them in. Pour over the dressing and stir it in. You don’t want to lightly dress this like you would a regular salad, you want to really slather the stuff on. Soak the rice papers for a few minutes until soft, take three and put in about two-three tablespoons of the chicken and cabbage and arrange into a log shape. Fold one edge of the wrapper over the mixture and then roll them up so that one end is closed, the other open. This was by far the easiest of the dishes to make, and yet the best of the lot. It’s simply a matter of blending, shaping and frying. Served piping hot with some hot chilli sauce, these were delicious. Juicy, prawny and slightly salty and with an underlying citrus, ginger and garlic edge that really made them sing. Throw everything into a blender and blend to a thick paste. Shape into six ping-pong sized balls and flatten slightly. Heat about 1cm of oil in a non stick pan until it’s smoking hot. Then drop them in and shallow fry for about two minutes per side. Serve with chilli sauce and eat immediately. 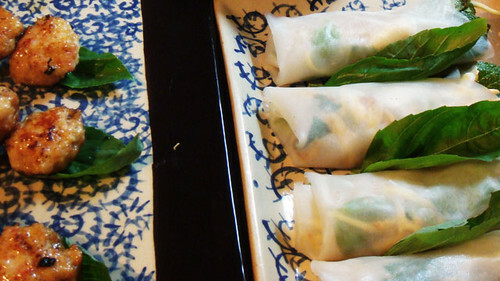 If I did these again, I would probably serve them as a starter with a teeny bit of super hot thai-style crunchy salad. What I am impressed at is that this is every night! I admire the dedication and am envious of the food. Not quite every night Tom It’s not really dedication because I seriously love cooking. It works for me in the same way a kick around with a football or watching neighbours works for other people – cooking is nearly always de-stress time. Chopping an onion with a bloody great knife does wonders for the blood pressure (unless you slip in which case it has a whole other effect). It makes such a change from sitting infront of a computer screen, which i do for most of the rest of my waling life. I am impressed by your fresh rolls – they can be very tricky to fold but you seemed to have perfected your technique to a T! Thanks Shayma – I had this massive bunch of basil to use so I just chucked it in. Scallions would be a fabulous addition – next time!